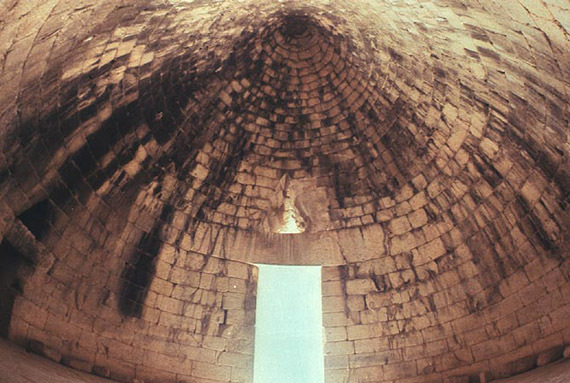 Nine royal tholos tombs were built in the immediate vicinity of the Mycenaean citadel in the 15th and 14th centuries BC. The most monumental of these are the so-called 'Treasury of Atreus' and 'Tomb of Clytaemnestra', with imposing fagades, originally decorated with green serpentin and red marble. These tombs were named after members of the Atreides dynasty, known to us from Greek mythology and ancient tragedy. They were plundered in antiquity, but their characterization as 'treasuries' recalls the wealth of the grave gifts that they once contained. The imposing and well-preserved Atreus tholos tomb is a stone-built, corbel-vaulted and pointed dome, 13.50 m. high with a diametre of 14.60 m. It has an adjacent rock-cut chamber, which measures 6.0x6.0x6.0 m. The tomb's 10.50 m. high monumental facade has a 5.40 m. high and 2.70 m. wide entrance. Part of the facade's architectural decoration is displayed in this room, while some fragments are kept in the British Museum. The tomb's magnificent entrance is reconstructed based on existing evidence. The great doors opened between two half colums of green serpentin with relief decoration while the pediment and relieving triangle were clad in red marble. This fagade was decorated with relief interconnected spirals and half-rosettes.